I’ve expressed my love for Venetian glass many times and the romance continues with this week’s choice. This shade of lime is especially dreamy. Actually, I do believe the gold foil centers of most of the beads causes the lime to impart a special glow on your neck. I have worn this twice and the compliments were many! It is my opinion that Venetian glass is made by true artisans on the Island of Murano, a vaparetto ride from Venice ( details of my visit there in Blog dated June 29, 2013). Those artisans are the designers and the flame workers: they both have their hearts involved in achieving outstanding results. You don’t find any of the Venetian beads I’ve showcased this year in a bead shop (apologies to my local purveyor, Beaucoup Beads in Scituate…I still love to shop with you! ), rather you have to go to shows where vendors lay out their best stuff, and make you drool! Regarding this necklace, the 11 squares trimmed with yellow measure 7/16th of an inch…small, but large enough to be noticed. There are smaller squares, only 1/4” across, that I used as spacers. 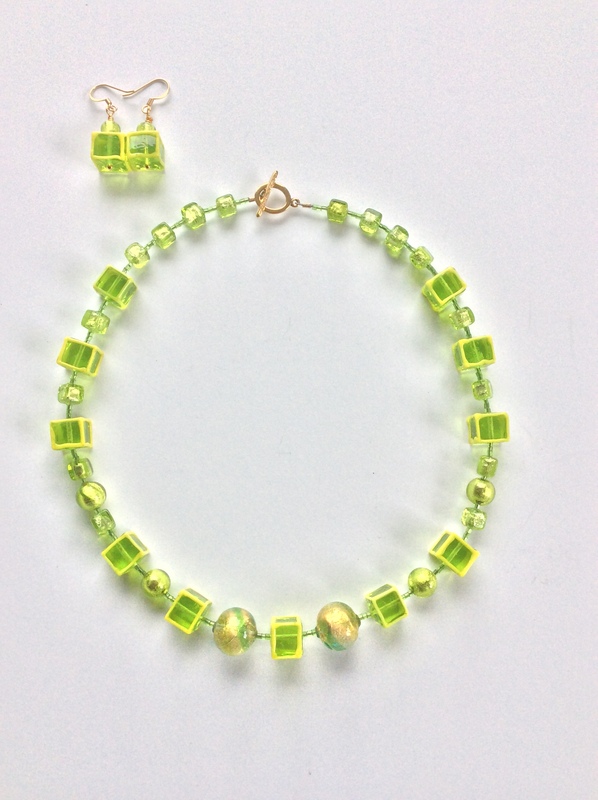 Be sure to notice two round lime beads with gold foil centers that comprise the focal point. In fact, all these beads except the distinctive square ones have gold foil centers. This 18.5” necklace comes with matching earrings. Gold metal clasp. The set is $109. I Love this necklace and earrings!!!??? Love the necklace! Reminds me of the beach. Crisp and vibrant! So fun seeing all your creations.